- RAW General Manager Kurt Angle has announced Ronda Rousey's first WWE TV singles match for next Monday's show in Jacksonville, Florida. She will be facing Alicia Fox. Fox vs. Rousey was made after Fox defeated Natalya on tonight's show. Rousey was in Natalya's corner while RAW Women's Champion Alexa Bliss was in Fox's corner. The post-match angle saw Fox and Bliss double team Rousey before retreating. Rousey is scheduled to face Bliss in a title match at the August 19th WWE SummerSlam pay-per-view from Brooklyn. 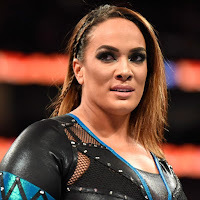 - No word yet on why Nia Jax was not on this week's RAW but she has not appeared on TV since losing to RAW Women's Champion Alexa Bliss at the WWE Extreme Rules pay-per-view on July 15. Jax tweeted the following GIFs during tonight's show with the eye-roll GIF coming after WWE announced Ronda Rousey vs. Alicia Fox for next week. Jax does not have a SummerSlam opponent as of this writing while Rousey will be facing Bliss for the title. Speaking of Nia, she took to Twitter during tonight’s episode of RAW and claimed that coachman often times says a lot of things just to hear himself speak.